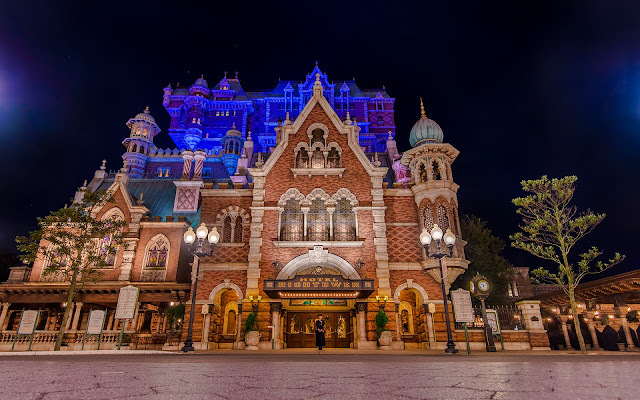 As far as looks go, the best Tower of Terror goes to--surprise surprise--Tokyo Disney Sea. This American Gothic is stately, majestic, and sinister at the same time. Although it has the same core as California and France's Towers of Terror, the facade has been completely reinvented, and the result is a building that is rich and immersive. And even if you're a little nervous about this Tower of Terror and its menacing idol, Shiriki Utundu, you'll probably still be amazed at the lovely sight of the show building! Eerie Hotel Hightower looms at the midnight hour.